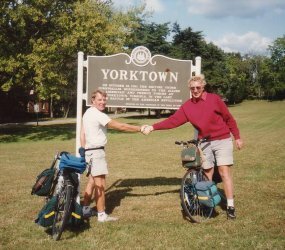 The log-book of a 4,300 mile bicycle ride across America from Pacific to Atlantic, the curious and interesting society we saw there, and the strange things that happened to John and Pete in 66 days. After 21 years nagging by me, Peter visited Dorset today and gave me a memory stick. 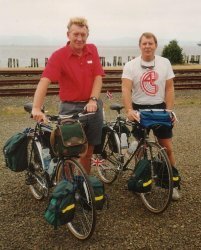 It held 70,000 words typed from his log book of our cycle ride in 1992. It was well typed too, and in .doc format. I have made no changes to content or spelling. And of course it brings back a flood of memories of incidents I had forgotten. Bless you Peter. Go to the 10 States: Oregon, Idaho, Montana, Wyoming, Colorado, Kansas, Missouri, Illinois, Kentucky and Virginia. Use your browser SEARCH facility to find any word you want on this webpage. The whole of Pete's diary is on this single page, around 70,000 words. Make the most of it!